Better Than Never: hello, colorado! We arrived safe and sound in Colorado yesterday afternoon. 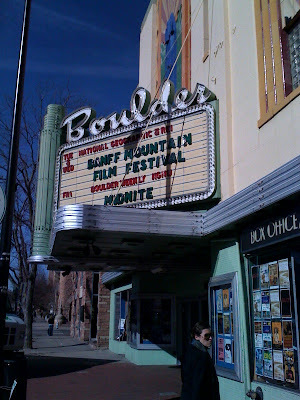 Our conference is in Denver, but we got to spend the afternoon in lovely Boulder. This was because Rachel, my colleague, has a librarian friend, also attending the conference, who lives in Denver, and who took us out lunch and to do some sightseeing in the general area. We had an awesome lunch at an Indian Teahouse, where I learned that one of my favorite beers is actually a local brew! (My preferred bottle is Ellie's Brown Ale.) I gawked at the city - the food! The shops! The dogs! - until I felt like a country bumpkin, and then I gawked some more. Here is my new plan B: if I don't get into an MFA program this time around, I am adding the University of Colorado - Boulder to my list. This morning Rachel and I got up early and used the hotel's fitness room. We did 30 minutes of cardio (I ran three miles and holy altitude! They were hard) and then used the weight machines for another 30. Rachel went to a morning pre-conference, but mine does not start until 1:30pm, so I walked to a coffee shop, had a giant soy latte, and read a book for a few hours. Yeah. Traveling is awesome, and Denver is even better!